Pasta salads are great summer food and perfect as a side for a cook out. 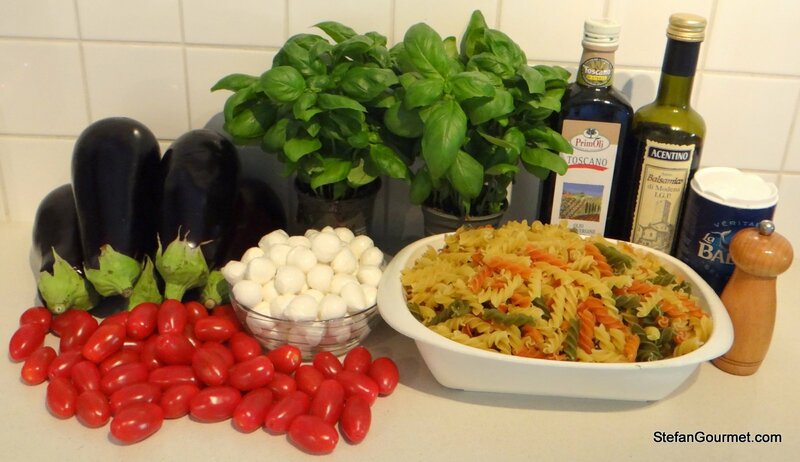 I like to prepare pasta salads with lots of vegetables, as a cook out or BBQ as we call it here usually involves a lot of meat. For some variation from a Greek style pasta salad, I prepared this pasta salad with eggplant, mozzarella, tomatoes, basil, and balsamic vinegar. These flavors go together very well, also without pasta. 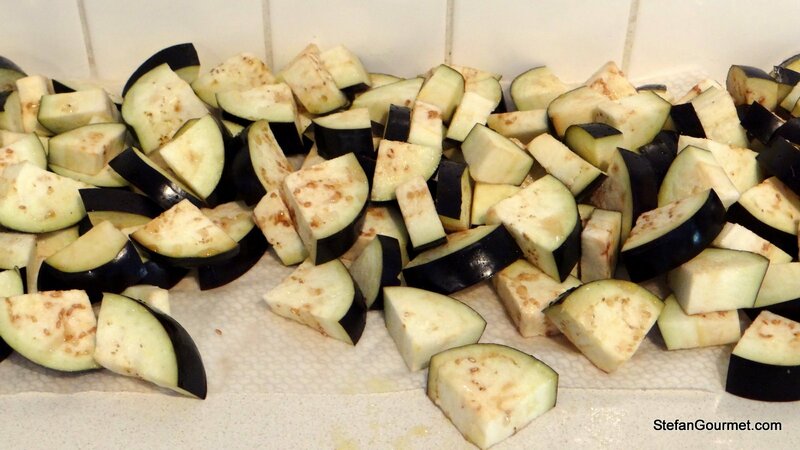 Cut both ends off the eggplants, cut them in quarters lengtwise, and cut into 1.5 cm (1/2 inch) slices. Sprinkle with salt and wait for an hour until quite some juice has been drawn out. Meanwhile, cook the pasta al dente in boiling salted water according to package instructions. 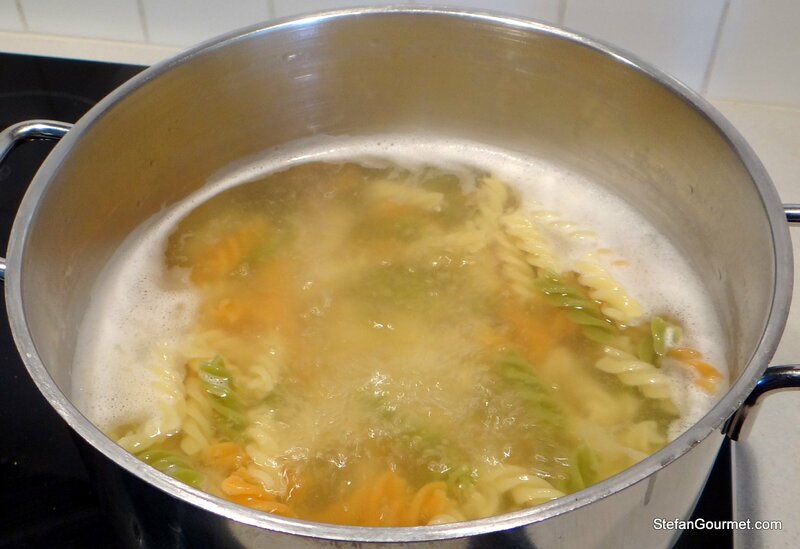 Rinse the pasta with cold water to get rid of the starch. If you don’t do this, the pasta will stick together. Lovely serving vessel isn’t it? It’s a cheap plastic blue bucket. 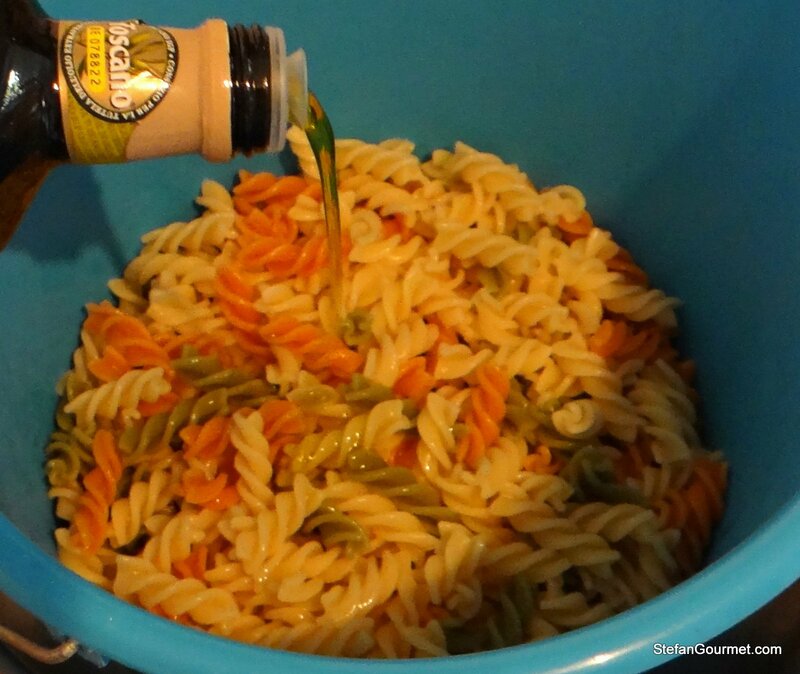 Not pretty, put very practical for a big amount of pasta salad. Add olive oil to the pasta and toss to coat the pasta with the oil. Again this is to prevent the pasta from sticking together. Preheat the oven to 225C/440F. Pat the eggplant dry with paper towels and toss with olive oil. Arrange the eggplant on baking sheets lined with parchment paper. Roast the eggplant in the oven at 225C/440F for about 20 minutes, stir, and roast for another 10-15 minutes until cooked and nicely browned. Allow the roasted eggplant to cool to room temperature. Put the tomatoes in an oven dish and toss with some olive oil. Roast for 20 minutes at 225C/440F. Allow the tomatoes to cool to room temperature. Drain the mini mozzarella balls. 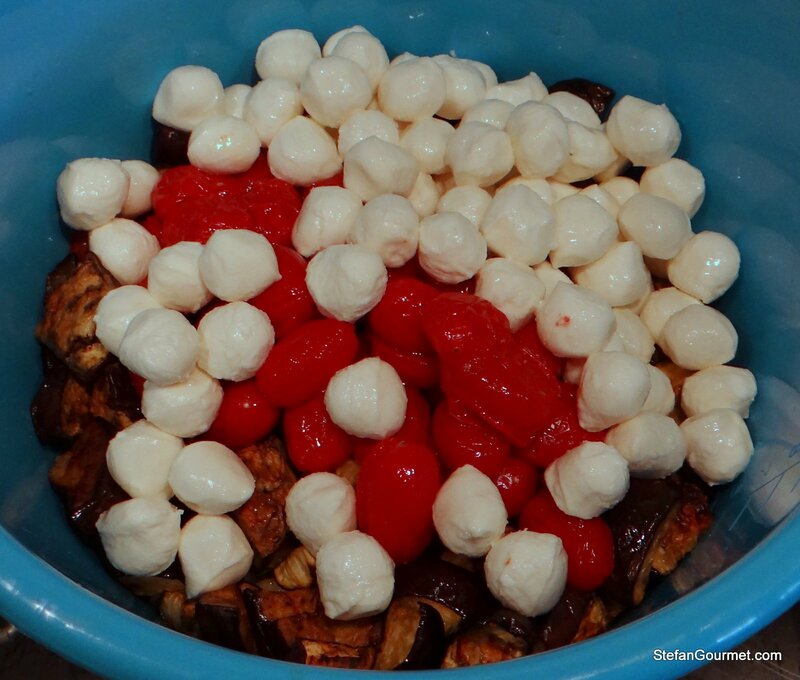 Add the mozzarella, the eggplant, and the tomatoes to the pasta. 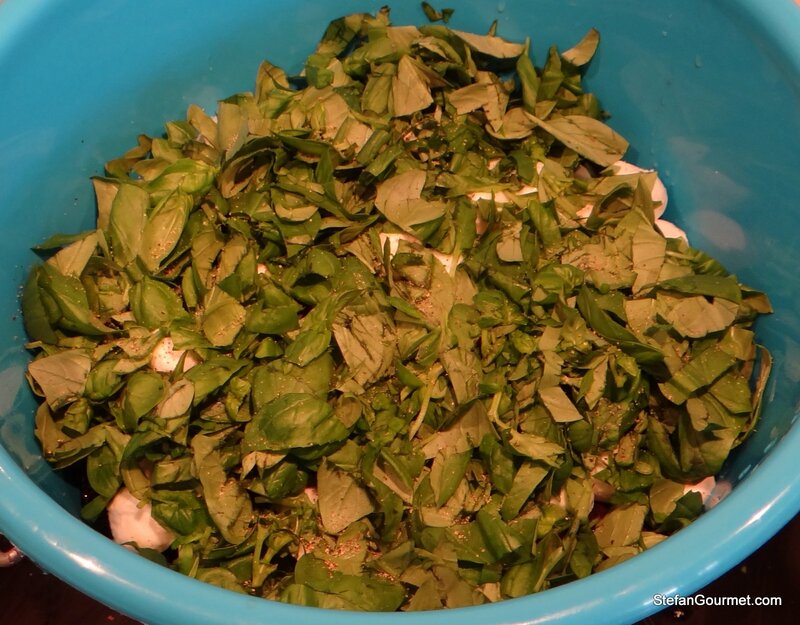 Tear the basil to pieces (or roughly chop the basil if, like me, you are too lazy to tear them one by one) and add to the pasta. 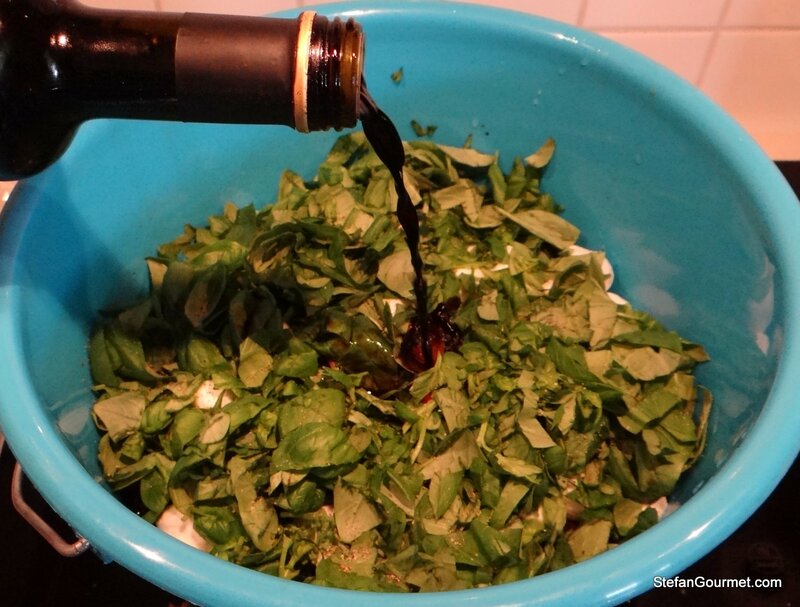 Add a nice glug of balsamic vinegar as well. Toss to mix. Taste and add more salt, pepper, olive oil, or balsamic if needed. Keep mixing and adjusting the seasoning until you are happy. Serve at room temperature. 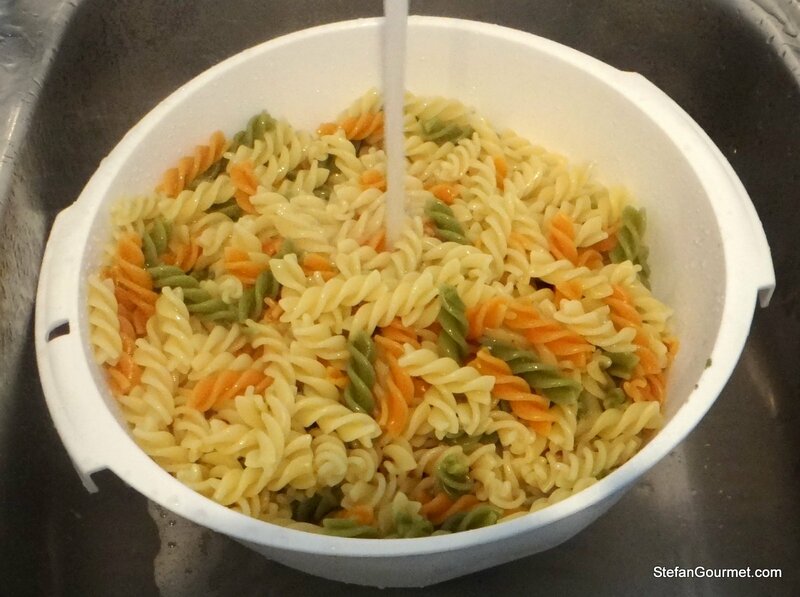 The pasta salad can be stored in the refrigerator if it is not served within a few hours. It will keep for a day or so. Leftovers are great for lunch. This looks ridiculously delicious. I have a huge love for anything ‘caprese’, as the flavours just seem to work so well together. 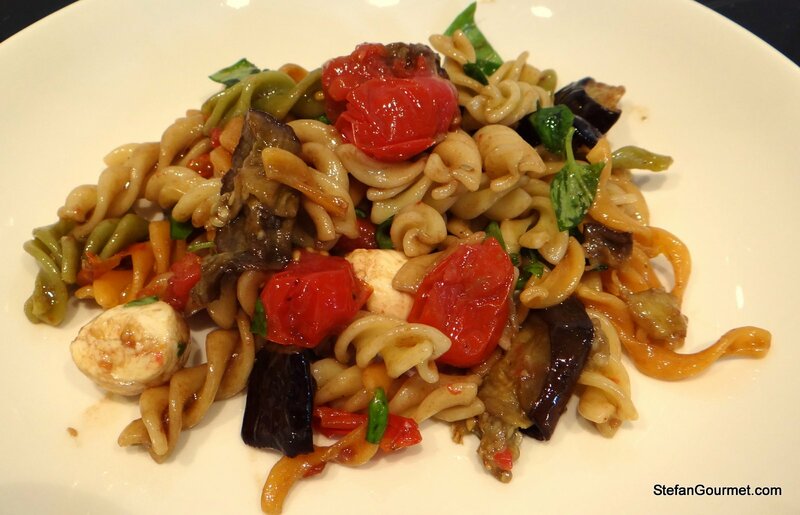 Thanks for sharing this pasta salad with us! Every delectable ingredient in this pasta, combination of which brings bursts of different textures of tastes. Yummy!! never thought of adding eggplant to a salad. What a lovely idea! 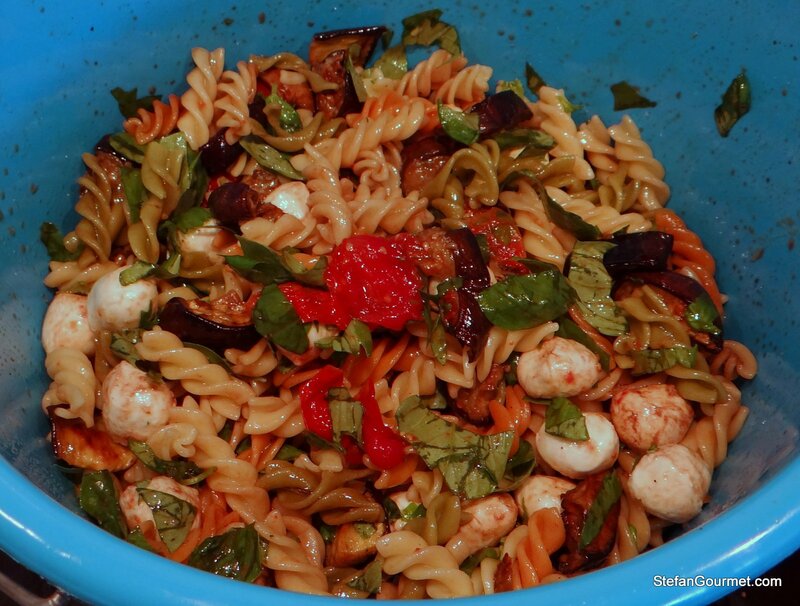 Fantastic pasta salad, Stefan, and it would be a welcome addition to any barbecue. I add grape/cherry tomatoes to my pasta salads all of the time but never thought to roast them first. That’s such a great idea. It’s such a little thing but I bet the salad is much better because of it. Very nice, Stefan. You must have been feeding an army. Lovely. I find most pasta salads a bit bland – this one is NOT !! What a great pasta salad idea ! !